Hong Kong is a true city of contrasts, with East meeting West and new meeting old, and you can explore it all for less with cheap flights to Hong Kong from Australia with Globehunters. While it’s a very popular destination for business travellers, Hong Kong has plenty to offer everyone, with its stunning mountains and glistening skyscrapers. One of the main attractions is the Peak Tram, which takes you all the way up to Victoria Peak, which offers some of the most breath-taking views of Hong Kong in the whole city. Or down on the waterfront you can see Hong Kong’s own version of the Hollywood Walk of Fame, the Avenue of Stars. The harbour truly is one of Hong Kong’s best features, and you can enjoy a romantic cruise across it via the Star Ferry, or for a livelier experience, head inland to the markets of Cheung Sha Wan Road and Temple Street, which come alive at night with traders selling local food and drink and other wares. And for a more spiritual attraction, head out the Giant Buddha statue in the mountains of Lantau Island, or follow the Ping Shan Heritage Trail to see some of the city’s temples and shrines. 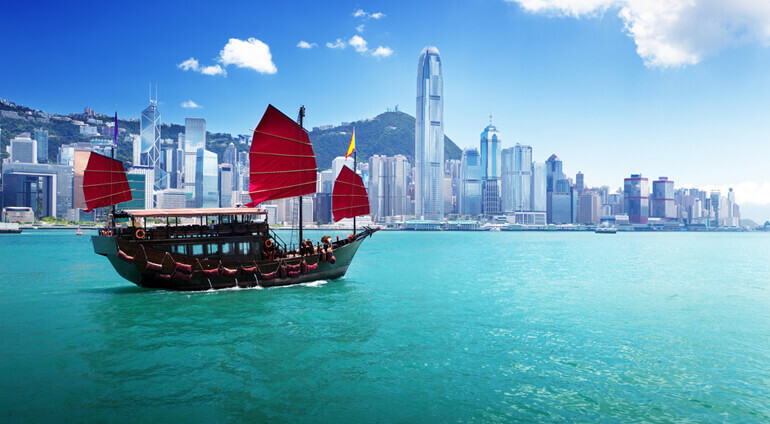 If you want to check out Hong Kong for yourself, be sure to check out our full range of cheap flights to Hong Kong below, including business class and first class fares too. Weather: Hot and humid summers with occasional thunderstorms and showers and often even typhoons, floods and landslides. Winters are usually milder and sunny, but get cloudier towards February. Here’s everything you’ll need to know when flying to Hong Kong from Australia, including flight times and entry requirements. Direct flights to Hong Kong are available from Sydney, Adelaide, Brisbane, Cairns, Melbourne, Perth and the Gold Coast, with the flight generally taking around eight to nine and a half hours. Australian nationals who have passports with up to six months validity can enter Hong Kong for up to three months without a visa, but if you wish to stay longer then you must apply for a visa from a Chinese Consulate at least six to eight weeks before departure. Hong Kong Airport is located on the largely man-made island of Chek Lap Kok, with multiple transport links to get you into the city centre, which is about 37km away. The quickest way is the Airport Express train, which takes 24 minutes to Hong Kong Station and runs every ten minutes. There’s also bus, taxi and even ferry services that you can take although these are all more expensive or take longer! If you’re looking to compare cheap flights to Hong Kong, get in touch with one of our experienced and friendly travel consultants, who will be happy to work with you to get the very best deal on your flights, car hire and hotel. All our bookings are 100% ATOL and IATA protected too to give you extra peace of mind.